There are many people who are usually fascinated by the beauty of having an aquatic scene right in their homes. They are the same people who get in the hobby of keeping fish in aquariums either in their homes or even in their offices. Indeed it has now been confirmed that having a comfortable, serene, and pleasant environment can really help to boost the productivity of a person. What better way to help spice up things in your office by making it a pleasant environment for yourself and employees than having a desktop aquarium in it? What is a desktop aquarium? A desktop aquarium is small type of aquarium that is usually designed to be placed on top of a table or a desktop hence the name. It is usually smaller than the regular aquariums and is sometimes referred to as nano aquarium. You can take advantage of the versatility of a nano aquarium to help you customize your workplace. With a desktop aquarium in your office, your office will definitely look smart, stylish and comfortable to relax in. If you are interested in purchasing a desktop aquarium for your office or home just be sure to do your research well to ensure that you buy that will best suit your budget as well as unique needs. 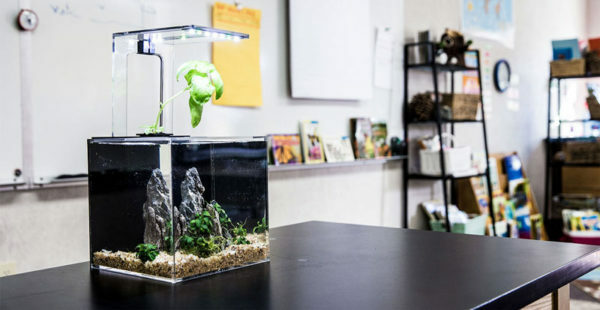 Why a desktop aquarium in the first place? If you are enthusiastic about fish or aquatic plants and like to have them right in your office or home space then you certainly will want to have an aquarium. Due to the small size of a desktop aquarium it is ideal use in places where there is space limitation. Perhaps you may be asking yourself to know if the small fish tanks are really good for your fish. The answer to this particular may be a yes or no. Even in a small tank if you properly set it up and performed routine maintenance everything will great to go. Small tanks that are not well setup from the onset of things as well as fish that aren’t properly cared for will simply just have a short life and die. Are there advantages of using small tanks? There are several good reasons why some people prefer to have desktop aquariums over the conventional aquariums. Well, in terms of money involved in setting up a tank and have it loaded with fish or plant having a desktop aquarium is an affordable option. Basically the desktop aquarium only just requires minimal investment and it will easy fit even in the minimalist space. There are many places where setting up the conventional aquarium may not just be the best option. A small aquarium that can easily be placed on top of a table can ideally be used in a classroom, inside the wardrooms in a hospital, inside offices and it will offer lots of benefits. So what should you consider when selecting a desktop aquarium? When choosing a desktop aquarium it is best to choose one that is fitted with everything that an aquarium should have. There so many factors that need to be taken into account in order for you to get successful with any small aquarium that you choose to have in your space. The support base of the aquarium is an important factor that should be taken into account regardless of the size of the tank. The support base must be solid and strong enough to support the aquarium perfectly well. One of the most common mistakes that aquarists usually make is under estimating the total weight of the aquarium when it is filled with water. Having it placed on a table or a stand that is not strong enough to support the weight of the aquarium can lead to it accidentally crushing. This is also another important factor that you will have to consider when selecting an aquarium to take home or in your office. If the space is limited you will go for an aquarium that is compact that will be able to fit nicely into the given space. You will however to give up so many additions that usually come with larger tanks. Perhaps having a smaller tank may not be ideal for you to keep fish. You may trade this by keeping plants in the aquarium instead. If you are a hobbyist and you want success especially with a small aquarium you need to have an aquarium kit. Buying a small aquarium that comes loaded with all the aquarium basic things like integrated filtration and built-in lighting is a good idea. This helps make you work easier and perhaps you may only need to buy an aquarium heater. It may be tempting for you to have the aquarium placed either on top of a cabinet or a desktop in your office. Before you do this, it is best that you be in the know about the total weight of the tank when it is filled with water. This will help you know the type of stand you can buy for your aquarium. You should be able to find a good aquarium stand that will be able to withstand the total weight of aquarium plus the water. A nano aquarium is small and will most definitely develop complications easily, thus it is advisable to keep the population there to a minimum. It also makes sense to select only the smallest fish that will survive in the small tank rather than trying to keep larger fish there.